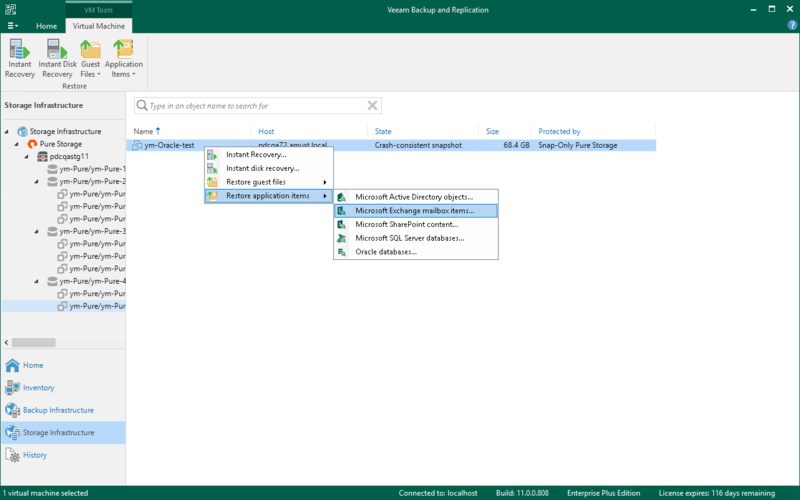 On the Home tab, click Restore and select VMware vSphere > Restore from backup or Restore from replica > Application items restore > Microsoft Exchange. Open the Storage Infrastructure view. In the inventory pane, select the necessary volume snapshot. In the working area, select a VM running Microsoft Exchange and click Application Items > Microsoft Exchange on the ribbon. You can also right-click the VM and select Restore application items > Microsoft Exchange mailbox items. In this case, you will pass immediately to the Location step of the wizard. Open the Home view. In the inventory pane, select Storage snapshots. In the working area, expand the necessary volume, select a VM running Microsoft Exchange and click Application Items > Microsoft Exchange on the ribbon. You can also right-click the VM and select Restore application items > Microsoft Exchange mailbox items. In this case, you will pass immediately to the Restore Point step of the wizard. To quickly find the necessary VM, you can use the search field at the top of the window. Enter a VM name or a part of it and click the Start search button on the right or press [ENTER].